Every time I eat romanesco I feel compelled to tell people about fractals in nature. I apologize in advance. 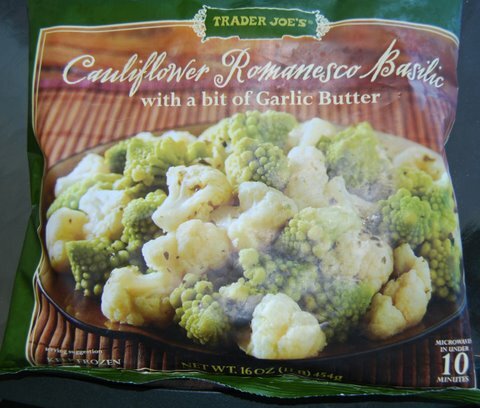 Trader Joe’s Cauliflower Romanesco Basilic is, pretentious name aside, a nifty little dish. So often it’s so hard to eat like a reasonably decent human being on a frozen vegetable budget. Oh sure, if you’ve got some skill in the kitchen you’ll manage to make do, but for the rest dinner time is a harrowing event not to be looked forward to. It’s parade of sorrow: sacks of frozen, mechanically-chopped spinach wilting into a messy wet pile in the skillet, or yet another bag of green beans that repel all attempts to make palatable or, worse, tiny plastic TV dinner trays with impossibly hopeful names that do nothing to mask the depression that infuses every misplaced kernel of corn or sloppy lump of beef product. What I’m saying is it’s tough out there for the unskilled bachelor (or bachelorette) folks, and it’s rare to find something to eat in the flash frozen food aisle that makes you feel like you’ve still got your dignity about you. Trader Joe’s awesome Hake en Papillote dish is one, and their Cauliflower Romansco Basilic is another. It not only provides a truly delicious side dish to any meal in minutes, bit it does so with so much class and style that you actually feel like a better human being while eating it. First off, it’s healthy. 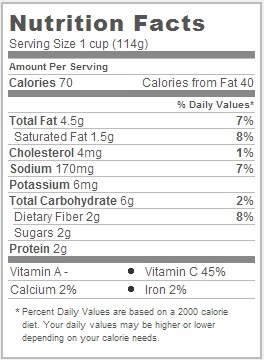 70 calories per serving, (serving size 1 cup), and oly 6 grams of carbs, two of which are fiber. The world garlic butter does show up right there in the title, so you’ve got to expect some fat, but at only 4.5 grams per serving it’s not an unreasonable amount. Now healthy is no big thing if it doesn’t taste good, and man does this stuff taste good. So good that you’ll relish munching each morsel of cauliflower and want to slurp up the juices after. How does it manage this trick on otherwise undesirable cauliflower? Through the miracle of garlic butter folks. Right out of the microwave your portion of steaming veggies are swimming in a sea of melted garlic-infused butter – enough to pack each piece with a savory, smooth, tongue-pleasing taste without going too heavy on either the butter or the garlic. It walks that knife edge of light but delicious and reaches the other side unscathed. And tender, my god – can we talk about tender? I’m going to wholeheartedly endorse preparing your cauliflower melange in the microwave because six minutes turns these ice-crusted veggies into yielding, supple morsels that provide absolutely nothing in the way of resistance. It’s like eating a cloud, so pleasant it is. Trader Joe’s ingeniously preps their broccoli and cauliflower for success by freezing the garlic butter sauce around each sprig or stalk. It’s a stroke of absolute brilliance that eliminates the fuss of having to deal with a enclosed secondary sauce packet. The sauce melts around each individual piece as you heat it, meaning that you can portion out your veggies in any quantity over any length of time and always get just the right amount of garlic butter sauce with them. Goddamn brilliant! All of this is, of course, ignoring the coolest part of the Cauliflower Romanesco Basilc, which is of course the romanesco – that craziest looking of vegetables adored by fractal-lovers and gourmands alike. If you’ve never had it before, don’t get too freaked out by it’s glorious, Fibonacci sequence exemplifying spirals, just relax and try some – it’s taste is halfway between cauliflower and broccoli. I absolutely applaud it’s inclusion here, or in fact, anywhere that it replaces it’s boring cousin broccoli if for no other reason than novelty. Would I Recommend It: You’ve got to try this one at least once. Final Synopsis: A downright scrumptious vegetable side perfect for any occasion.